comics development is coordinated through GitHub. The easiest way to contribute to comics is to register as a user at GitHub, fork the comics project, and start hacking. To get your changes back into comics’ mainline, send a pull request to jodal at GitHub. Patches accompanied by tests and documentation gives +5 karma and kudos. When hacking on comics, please follow the code style and commit guidelines below. Follow PEP 8 unless otherwise noted. pep8.py can be used to check your code against the guidelines, however remember that matching the style of the surrounding code is also important. Keep commits small and on topic, e.g. add one crawler per commit. Merge feature branches with --no-ff to keep track of the merge. When expanding API to accommodate new crawler features, commit API changes, then new crawlers in a separate commit. When changing existing API, commit API change and crawler changes in same commit. If this commit looks too big you should be working in a feature branch not a single commit. Same policy applies for non-crawler changes. comics’ data model is very simple. The comics.core app consists of three models; Comic, Release, and Image. 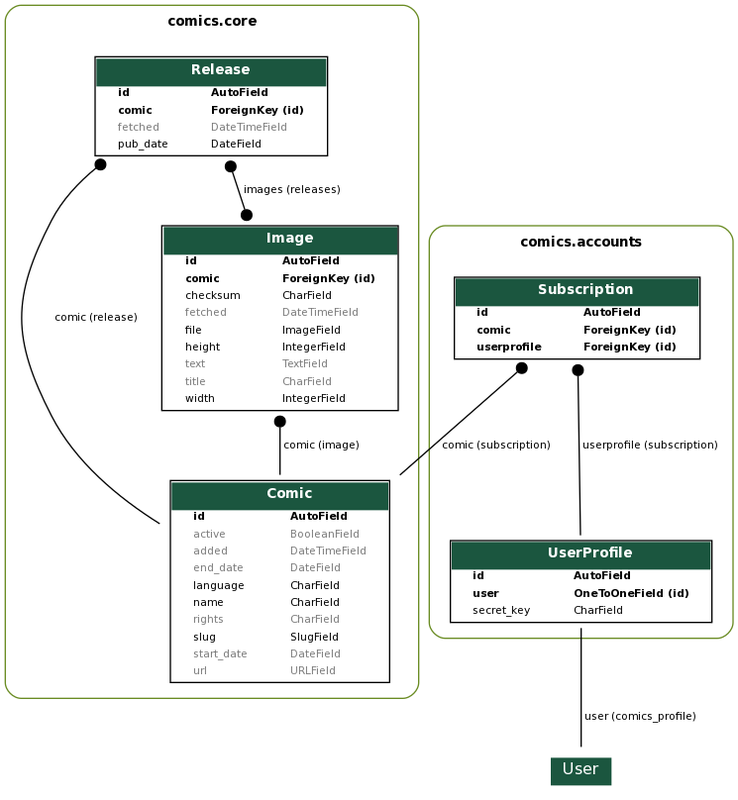 The comics.accounts app adds a UserProfile which add comic specific fields to Django’s user model, including a mapping from the user to her preferred comics. Deprecated since version 2.0: The comics.sets app has a model named Set. This model is deprecated and replaced by UserProfile. Changes to the data model are managed using Django’s built-in database migrations. If you need to change the models, please provide the needed migrations. comics got some tests, but far from full test coverage. If you write new or improved tests for comics’ functionality it will be greatly appreciated.